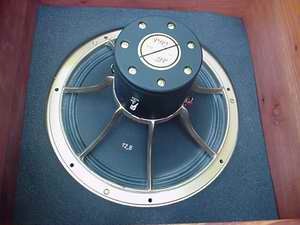 The KM30 is a so-called "time-aligned" coaxial unit, this means that time-differences between tweeter and woofer are nil. 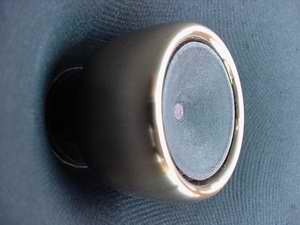 At the center of the woofer is a heavily modified piezoelectric tweeter mounted in a bronze chalice. The membrane of the tweeter is made of concave shaped paper. Frequency response is from 10Khz up to 30Khz and matches to the woofer which has a response op to 10Khz, hence a filter is not needed. 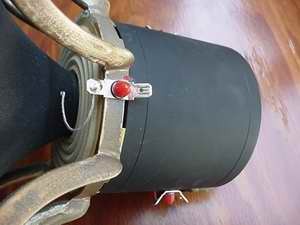 All units are equipped with a massive Alnico magnet. The KM30 has an efficiency of 97dB and has an impedance of 16ohms. 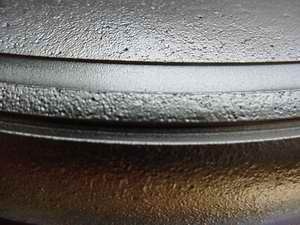 Resonance frequency is 36hz and a Qts of 0.59 makes it suitable for an open baffle. The total weight of the cone is only 12,8 gramme! Woofer and tweeter have their own connectors. The massive bronze chassis is responsible for a 9,3 kg weight! 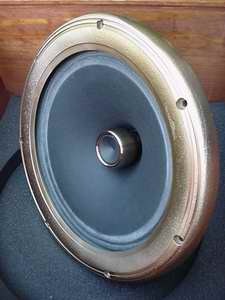 Hans Kortenbach (Musical Affairs) assisted me in mounting the KM30 into the open baffles; due to the relative high weight a job for two.. The units are mounted using 7 copper bolts (provided with the unit) and fitted into the opening used by the Philips AD12202. An hour later the units were mounted and connected: let the music play! 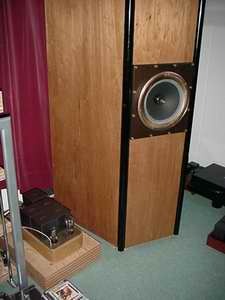 Right from the first tones it was clear to me that these KM30's completed the well proportioned sound of the AD12202. These units are really fast! At once it is clear that a whizzer as used in the AD12202 is really not more than a compromise when compared to the KM30's piezoelectric tweeter. As the tweeter relieves the woofer from producing any sound above 10Khz, the woofers' capabilities come clear. This is a disadvantage for the Philips AD12202 where the whizzer is part of the cone and thus increasing the mass of the cone hence slowing it down where in fact it should be faster to produce any sound above 10Khz... Also the big Alnico magnet contributes to the fast sound as it is far more powerful than the Philips ferro-dure magnet. Especially at the mid- and low-end response tones are more precise and better distinguishable. Highs are precise and o so sweet, not to be compared to the standard piezoelectric tweeters which are ready available from most shops! I must say that I've never heard highs as beautiful as from this unit... Also the very low-end response is more accurate, faster and lower in frequency, probably because of the lower resonance frequency of 36hz. Also these unit are way more coherence and that is really something to admire, I mean, in normal life coherence in sound is something that we take for granted and do not think about... but, when heard from your system it is really fantastic! Are these units worth the money? I mean, about Euro 2000 is not peanuts.. I think that given the lifetime warranty and build quality combined with the given performance, they offer much value for money..
PHY-HP units are available from Musical Affairs (Netherlands) or visit PHY-HP.com for local distributors and more information.